Todmorden Town Council has raised its concerns over the new Lidl store on Halifax Road with the supermarket chain’s head office after discovering fears of an increased flood risk. Planning permission for the store was granted by Calderdale Council in October 2016, with the town council welcoming the application, saying it would redevelop derelict land and provide much needed job opportunities. But it has since been suggested that the conditions of the approval have not been met. Halifax Road is prone to severe flooding and the Environment Agency considers the site and surrounding area to be in its highest risk zone for flooding. A condition of the planning approval was that before the start of the building works, plans for the disposal of surface water at the site would have been submitted and approved to ensure the store did not increase the risk of flooding to the surrounding area. According to the council, this has not happened and the building work is already well underway. In a letter to the chief executive officer of Lidl, the town council said: “Todmorden Town Council is extremely disappointed. In particular, that a suitable scheme for the disposal of surface water has not been agreed with Calderdale Council, and that construction and occupation of the new store has gone ahead in direct contravention of condition three of the planning consent. 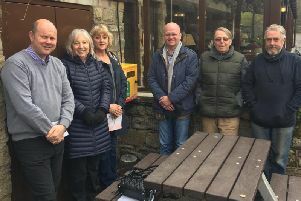 “Todmorden Town Council has received a number of representations from residents and businesses in the area surrounding the new Lidl store. They are extremely worried and concerned that the new Lidl store will actually increase the likelihood and frequency of flooding, further impacting on homes, properties and businesses that have already experienced significant damage from flooding over the past two decades. “The fact that the planning consent conditions have not been fully discharged has further added to these concerns. “Todmorden Town Council fully supports the enforcement action that is being undertaken against Lidl UK GmbH to ensure that all the planning consent conditions are fully discharged. “We therefore request that Lidl UK GmbH fully meet its obligations in respect of the new Lidl store and fully discharge all the planning conditions as soon as possible.